RGB Fans – Two RGB fans are included in this great case to add style and personality. 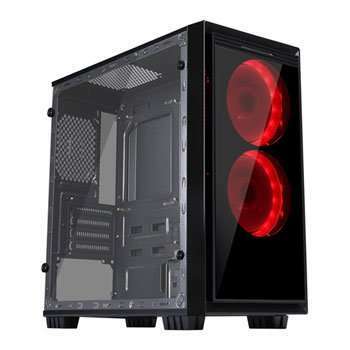 Acrylic Side Panel – The Halo Mini comes with a full Acrylic left side panel to allow the user to show off their internal components. Ultimate Cooling Experience – The Halo Mini supports up to 4 fans in total to allow the user to push the PC to the limit. RGB Hub & IR Remote Controller – An RGB hub and an IR remote controller is included with the Halo to give the user complete control on how there case looks and feels. I/O Ports – 1 x USB3.0, 1 x USB2.0 and HD audio are conveniently located on the top of the case for easy access. Removable Dust Filter – A dust filter on the top of the Halo Mini helps to prevent dust from getting into your build and helps improve the performance of your chassis.